You know you need to get out of the house when… | Separated by a common language. you see the jingle cats on MuchMusic. oh man. you’ve got to be doing better things than that! What’s Jeero up to? I hear you’re sick, yo. Man, I am soooo stoned. 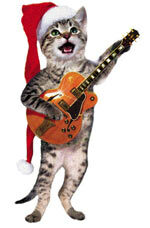 I just saw a cat with a guitar telling me Lauren watched muchmusic until she was sick! That was the best burger ever! Is that Josie, or one of the other Pussycats?